This past year the Silhouette was one of the top gifts for women who like to create! 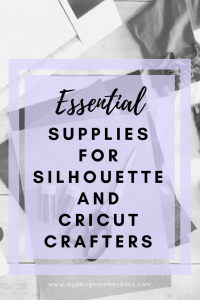 Like some of you, I got mine for Christmas too (several years ago now) and was ready to start designing, cutting and producing cute stuff for my family and beyond, immediately (or so I thought)… I’m going to share (from experience) my list of the essential supplies for Silhouette beginners. I excitedly went to get it out of the box, plug it in, and start cutting, but as I jumped in head first I quickly realized I didn’t have all the essentials on hand. My experience might have gone a tad bit smoother had I been prepared, from the get go. Hindsight is 20/20 so let my learning curve help guide your future direction! 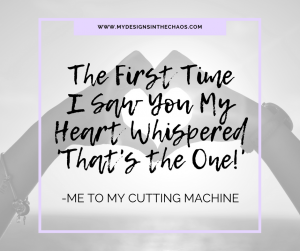 Here are my suggestions of 5 essential items to have in your ‘craft closet’ when first starting out with your cutting machine. It will help those first few projects go so much smoother and will be beneficial no matter which cutting machine you have. Vinyl: This seems like an obvious supply but when I was first starting out I had no idea that there were so many different types of vinyl. I would recommend getting a starter pack like this one here. This pack even includes a guide to each vinyl type! It is also fabulous because that way you have a little bit of everything to play with as you learn. Check out more of my vinyl suggestions here. Quality Weeding tool: Just to be clear, weeding is the process of peeling away the vinyl that you will not use on the design. (feeling confused by all the vocabulary with your machine? We decode all the terms over in this post) Depending on the design, you might need a tool (or several) that help you get into the nooks and crannies of a cut very carefully! (think inside of e’s or o’s or g’s etc.) You can stick with the silhouette or cricut brand name tools here (this was my first pack) and here or as strange as this may sound, dental tools work really well. A set like that one I linked works great! These tweezers are also life savers when looking for those missing dots over the i’s and when working on mini size or super intricate designs. Transfer tape: Transfer tape is something I didn’t even realize I would need when I first started. As soon as I realized I needed it I quickly ordered a roll and now I think I have enough to last for a lifetime! The only problem was the tape I ordered isn’t clear and it is a nightmare to try and layer with. Don’t make my mistake! This transfer tape is clear which makes lining things up super easy. It is perfect to help you get your decals straight and look professional. You can also use contact paper. It works just as well and is a little bit cheaper. Good lighting: The perfect way to weed is with a hands free light! Now, please keep in mind this is not fashion advice. Sporting a headlamp won’t be the trendiest look but it will def save you time and vinyl which in my book is totally worth it! This light here works wonders!! There is one last thing that you might want when first starting out and that is cute designs. I just happen to know of a wonderful spot to pick some up! Our shop is full of designs that range in difficulty levels. We have some that are perfect for someone just learning the ropes. Not too complex, not too much layering and cute clever and practical sayings. 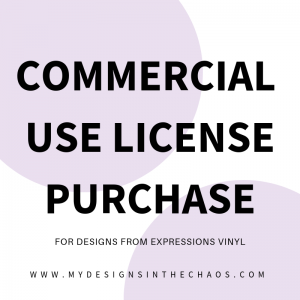 They are great for cups, shirts, baby bodysuits, dish towels, and more. In addition to our forever freebies, we release a new release freebie each Friday and Monday. Follow us over on our FB page to stay in touch. 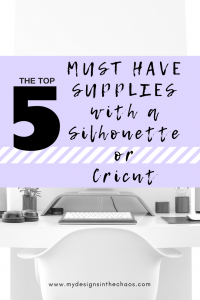 Now, these aren’t the only supplies that I have (what can I say I love crafter gadgets as much as the next chick), but these few things will get you going on the right path (or rabbit hole as my husband says). They are the top essential supplies for Silhouette beginners. Check out all my favorite craft goodies here. You will have all the things monogrammed and vinyled (no it isn’t a word, but yes it is a real thing!) in no time! We want to hear from you! What are you favorite supplies to use with your machine? Also spread the love and share this post with a friend who might just be starting out and don’t forget to Pin it for future reference.